deadline to apply: January 31, 2019. There are two traffic signal boxes to be transformed into works of art. The BACC utility box program has been very popular in Benicia. Here’s your chance to be part of it. There are currently two more city utility boxes available to artists to transform. This is a paid project and the Arts and Culture Commission will also pay for supplies. We are accepting applications now. Applications must include both the application and the application cover sheet. Selected Benicia’s downtown benches need a facelift! We are expanding the public art initiative to include selected city’s benches. There are 10 benches available to artists to transform into works of art. This is a paid project and the Arts and Culture Commission will also pay for supplies. We are accepting applications now. Applications must include both the application and the application cover sheet. These projects are great opportunities to have your work viewed by the entire town and visitors to the area! It’s a great project in which student artists, art groups/guilds, or individual artists can engage with the community in a very tangible way. It’s free to apply and artists can apply individually or as a group. Each project requires a separate application. The deadline to apply for both of these projects is December 17, 2018. It's Halloween Spooktacular Time Again! Join us FRIDAY,OCTOBER 26, 2018 at the Majestic Theater, Downtown for a showing of the classic film, Abbott & Costello Meet Frankenstein! Then go across the street to Elvaritas Cantina for a Taco Bar, Nachos, and more! For Information call Helaine at 707-746-4358. Online ordering available soon! Benicia’s Arts & Culture Commissioner Chairman, Terry Scott (right), accepts check from Valero’s Paul Adler. Benicia’s ongoing Public Art initiative received a significant boost last week with a major donation from Valero Benicia Refinery to support the City of Benicia’s Arts & Culture Commission’s five-phase citywide art program. Valero donated $19,900 to the Benicia Library Foundation’s Friends of Public Art program for support of the Commission’s ongoing efforts. Valero’s Paul Adler, Director of Community and Government Affairs, arranged for the gift by Valero. 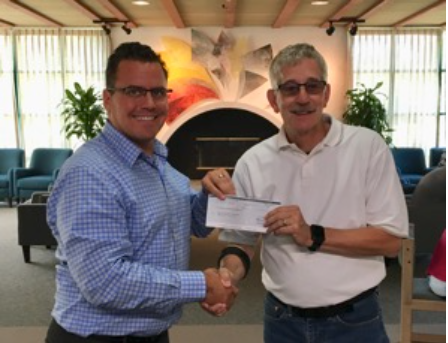 Terry Scott, Chair of the City’s Arts & Culture Commission, accepted the check on behalf of the Friends of Public Art Benicia. The Friends of Public Art Benicia is a new organization, founded to support the work of the Arts & Culture Commission, and operates currently under the umbrella of the Benicia Library Foundation to raise funds for public art in Benicia. Visit https://www.facebook.com/FoPABenicia for more information and to stay current with the group’s activities.